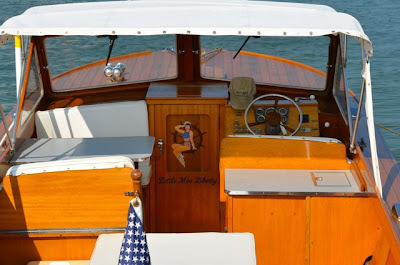 News and views, history and humor, about the lake I love. News and views, and history and humor, about the lake I love. 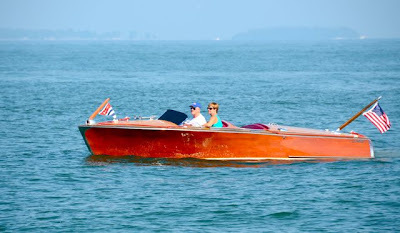 I had the good fortune today to attend the 8th Annual Lakeside Wooden Boat Show at beautiful Lakeside, Ohio, the famous "Chautauqua on Lake Erie." The boat show is put on each year by the Lakeside Wooden Boat Society. 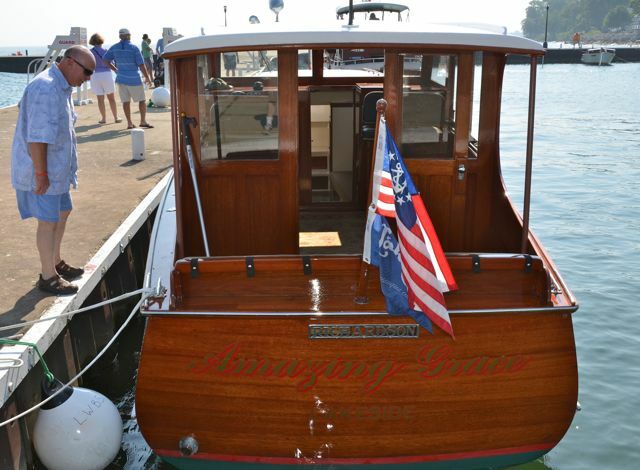 There were over fifty boats on hand, ranging in size from 9 to 57 feet in length. 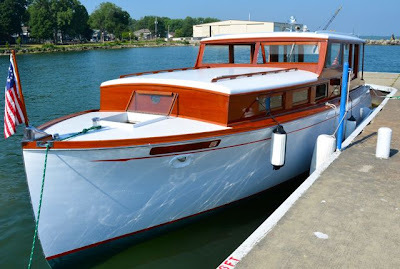 I arrived early in the morning with my brother-in-law who had a 16' Lyman in the show. Despite a virtual flotilla of trailered boats converging on this little hamlet by the lake, setup was quick and stress free, thanks largely to organizer Mame Drackett. 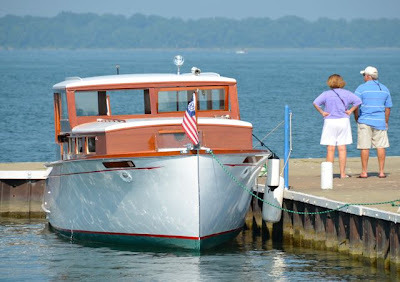 With the boat in its assigned spot, we were able watch the arrival of the other boats and enjoy the festivities. Boats arrived by both land and water. 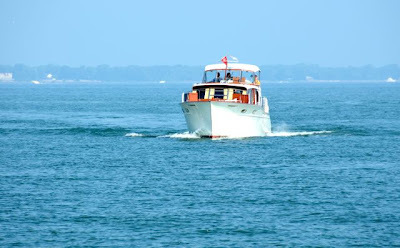 At first a trickle, the pace picked up quickly as boat after boat chugged around the Lakeside breakwater and were immediately greeted by orange-shirted harbor masters who instantly barked orders over walkie-talkies to assistants who rushed to the dock or plunged into waste-deep water to secure the arriving boats to the pier. I was impressed at how well organized it all was. In addition to the beautiful antique wood boats, there miniature boats as well, with members of two model boat clubs , the Cleveland Model Boat Club and the Maumee Valley Model Boat Club, on hand to display their craftsmanship. It was a beautiful day for the boat show. Although hot in the afternoon, the moderating influence of the lake helped out a lot. But it was all about the boats; admiring not only the fine lines of these classic craft, but also the craftsmanship of the boat owners who work so hard to restore and maintain them year after year. And if that wasn't enough, the Lakesiders provided a great and supportive venue for it all. A nice lunch was available for a small free and there was a live band on hand performing 70s and 80s rock classics. Now on to the boats. I snapped some great photos. Here are a few to get started. I will upload more throughout the week, so keep coming back! Lyman with some nice artwork! Check back tomorrow for more uploads! Lake Erie generates about $10.7 billion of tourism and supports 119,000 jobs. The fishing industry has a $1 billion impact on Ohio's economy, and 3 million Ohioans rely on Lake Erie for drinking water. I was born and raised in Port Clinton, Ohio, along the shores of Lake Erie. My Dad used to tell me about the “old slave ship” that burned offshore, less than half a mile from our home. When I landed my first job as a reporter and photographer for the local newspaper I began to collect information about that old slave ship, the historic sailing ship Success. This quest became first a hobby and then a passion and, finally, a writing career. I enlisted in the Army and retired after 20 years as a Chief Warrant Officer. I worked for another 15 years as an investigator in Alaska before returning to the shores of Lake Erie. My first novel, Trophy Kill, is a murder mystery set in Alaska. Work on my second novel will commence shortly as I continue to complete Heart of Teak, the history of the old ship Success. Copyright 2011 Rich Norgard. Travel theme. Powered by Blogger.